DRILL TEAM CANCELLED TONIGHT (29 SEP 15) due to weather! All cadets, including new recruits, are required to participate in tagging. This is the squadron’s primary fundraiser and as such, all are required to contribute. New recruits are required to complete 2 shifts, while the returning cadets are required to complete 3 shifts. If you cannot complete your shifts, please bring a signed note by your parent/guardian on Monday. Cadets will meet at LHQ (basement of the daycare) for all shifts. Sunday, October 4, 2015: 10:30 am to 5:30 pm. NOTE: Optional ½ day (1 shift) is in the afternoon 12:30 pm to 5:30 pm. If you arrive at 10:30 am, you are required to complete a full day (2 shifts). No exceptions will be made. Cadets need to arrive 30 minutes before their shift starts (except for Friday – just come as early as possible). Cadets who are staying all day on Saturday and Sunday will receive lunch money and will stay at the locations they are tagging at for their lunch. Cadets are reminded that they have 30 minutes for their lunch. Wear Civvies on Monday, October 5, 2015! All cadets are invited to donate $2.00 to the squadron and wear civilian attire on Monday! After wearing your uniform all weekend, it’s nice to top up our fundraising goals and wear something a bit more comfortable (casual but tasteful). Should you choose not to participate, that is fine. We request you wear your uniform as per usual. For returning cadets, please see below appointment list for Monday. If you miss your appointment, you will be moved to the bottom of the priority list so please ensure you make note of it and arrive at the noted time. If you are not on this list and have uniform issues, please make an appointment with supply ASAP as all cadets must be in uniform. We will not exchange a uniform part until the old one is returned (unless it is lost). Cadets are reminded to bring the old parts to exchange to their appointments. 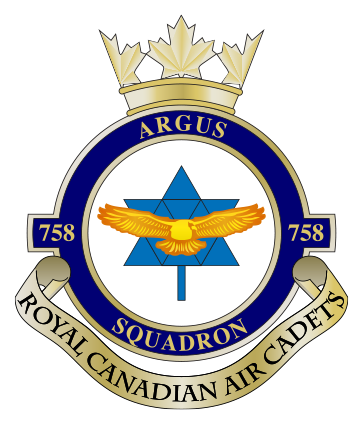 758 Squadron will be conduction an Aircrew Survival Field Training Exercise activity as part of our mandatory training at Albion Hills Conservation Area, 16500 Hwy 50, Palgrave ON, L0N 1P0, Tel 905-880-4855 on the weekend of 16 to 18 October 2015. All cadets are invited and encouraged to participate. Specific details can be found in the permission form below. Permission forms are due on Monday, October 5, 2015. ← Drill Team Cancelled Tonight!